Counting Computers: Inspecting a computer, Interact senior leader Justin Bifeld examines the donations for the Interact Computer Drive on Jan. 14. Interact leaders noted an increase in this yearís donations in comparison to previous years. Interact held the annual Computer Drive on Jan. 14 to collect unwanted computers and medical equipment for donation to the Cerebral Palsy Association of Greater Chicago. According to Interact sponsor Mark Gallagher, the donations that could not be reused went through a recycling process to recover precious metals to be used in other products. 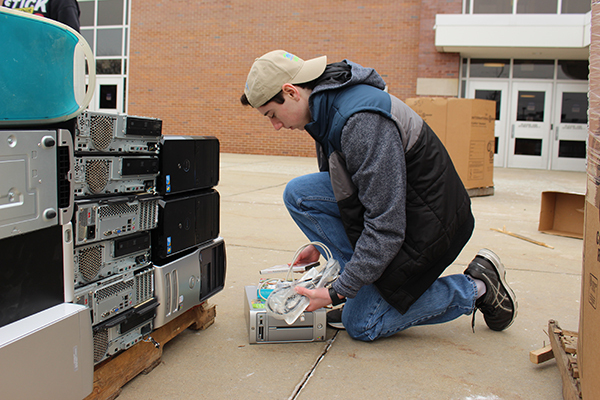 Student organizer Justin Bifeld said the drive’s main goal was to collect material that could be donated to the Cerebral Palsy organization which would be implemented in more eco-friendly ways instead of ending up in a landfill and going to waste. Bifeld and Gallagher both expressed that a steady decline in donations over the years had brought consideration of this year’s driving being the last. Both were very surprised that the drive was so successful and brought in a total of 1.6 tons of material. “In actuality, the numbers have been going down in recent years because I think we saturated the number of folks who can donate,” Gallagher said. Bifeld was one of the students who reached out to new media outlets in order to acquire more traffic at the drive, Gallagher said. According to Gallagher, this new method of distributing information to members of the community directly influenced the amount of donations received and brought about a change in attitude towards the future of the computer drive.